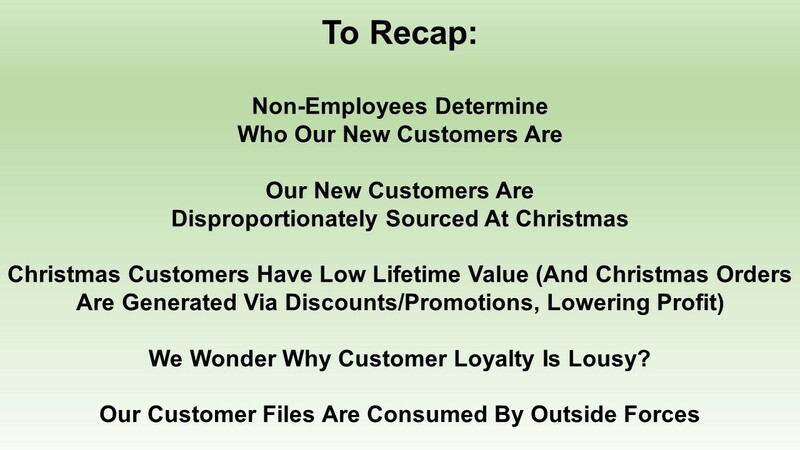 Here's a slide from my updated Customer Acquisition presentation (click here). Now, I've been publicly holding this little fact back for quite a while (not to paying clients, of course) ... but in repeated lifetime value simulations, this always comes up. 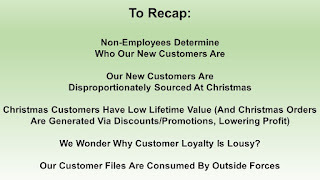 I'm repeatedly asked why customers are not loyal ... and the data consistently points to our own issues. 1 - For the average pure catalog brand (i.e. was a cataloger before the internet arrived in 1990), 85% or more of new customers come from one of the catalog co-ops, of which there are a handful. 85% of your customer base has been recruited by the co-ops. The same thing goes for Google/Facebook in e-commerce, FYI. 2 - Catalog circulation plans overload names into Nov/Dec, because those are more "responsive" timeframes. Names are acquired. 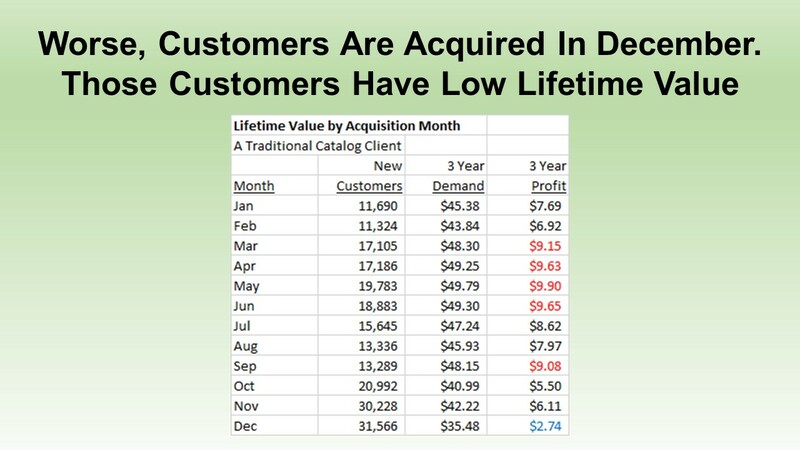 3 - On average, most catalogers and e-commerce brands do not measure lifetime value. 4 - For most catalogers not possessing a strong seasonal business in Spring, between 25% and 50% of annual new customers are acquired in November / December. 5 - To acquire these customers, %-off and free shipping promotions are offered. These promotions frequently harm customer acquisition costs. 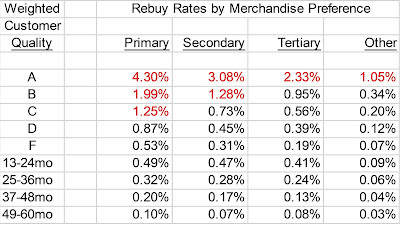 7 - The customers you acquire in March - June repurchase during responsive times ... and then repurchase during November/December. They are more valuable. December buyers are recent in January/February, when they are not likely to buy again. The customer goes dormant until November/December, at which time the customer purchases with a discount and free shipping. 8 - The dynamic is not limited to Customer Acquisition. 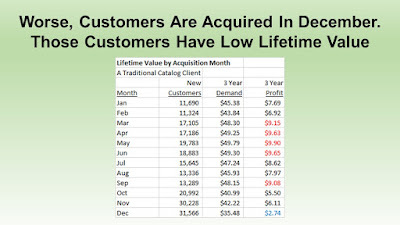 Look at customers who place a third order, by month of third order (for a client analysis conducted last week). I then measure three year lifetime value. It's the same story, just at a different magnitude. What is the dynamic I'm talking about? Your co-ops do a good job of optimizing for Nov/Dec response. They find buyers who are likely to buy in Nov/Dec. These customers often purchase via a promo (#cybermonday), and are therefore less profitable in their a first order. Because the order happened in Nov/Dec, lifetime value is less. 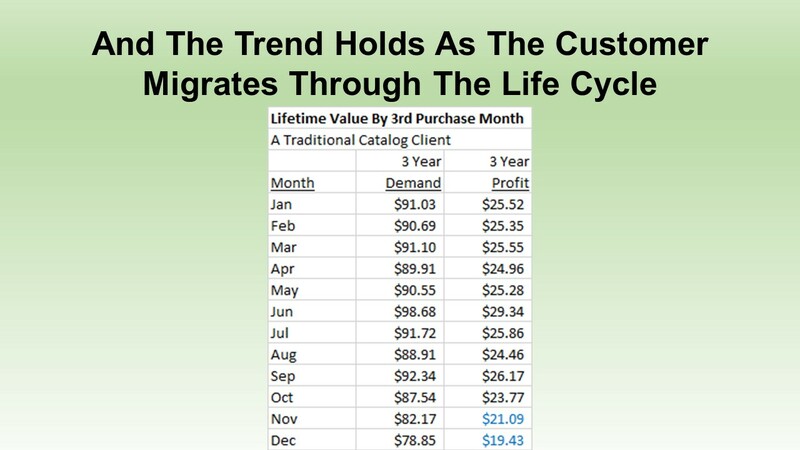 Because you try to maximize Nov/Dec, your loyal buyers are less valuable in the future as well. 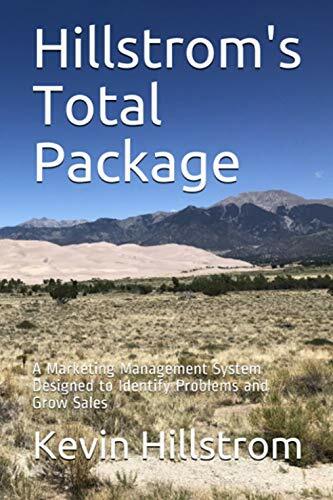 Plant your customer acquisition seeds early in the year. Harvest your yield by early Fall. Enjoy Christmas repurchases. Generate profit next year. Do this by reviewing the tactics in my Customer Acquisition presentation (click here) and build out your Brand Response Marketing team. Your co-ops know this happens, they've had your data forever. Ask then why they do not optimize for long-term success? Calculate lifetime value. Any analyst and/or vendor should do this as a matter of practice. Contact me (kevinh@minethatdata.com) if you need help. 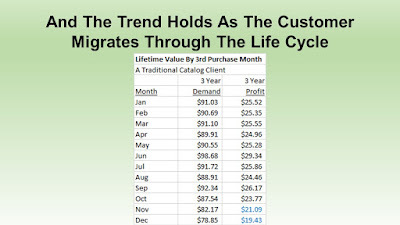 I use a simulation of 100,000 customers over "x" years to measure lifetime value for any segment. Your vendor partners don't do this. Are you at NEMOA this week? You are paying NEMOA a lot of money to attend. Your vendor partners are paying NEMOA a lot of money for prime speaking gigs, so that they can get you to spend a lot of money. How about using the conference as a forum to teach your vendor partners to optimize for long-term value, so that you, your vendor partners, and NEMOA can all make a lot more money? Seem reasonable? Everybody wins! How is that a bad thing? The same logic applies to Google/Facebook in e-commerce. I see the same thing, repeatedly. Challenge them as well. Your vendor partners are optimizing for immediate conversion/response. They tell you to be data driven. They are using data to sub-optimize customer loyalty and future profit. That's not acceptable. You can fix this problem. But you need to speak up.